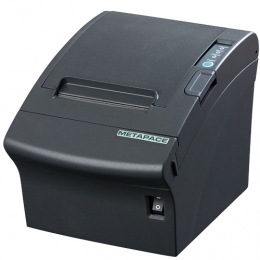 The Metapace T-3 is a professional direct thermal receipt printer available as a complete package, including accessories, at a bargain price. It combines the best properties of the previous Metapace POS printer family with new features designed to facilitate work processes a faster print speed, an on-board USB plus a Wi-Fi option. Lightning-quick printing of slips and receipts with up to 250 mm/sec. Your advantages are clear the high printing capability and speed of up to 250 mm/sec., its standard five-year warranty, as well as the free of charge accessories. At 7 dots/mm 180 dpi, it prints high quality logos, graphics and text. It has a powerful processor, as well as 64 MG SDRAMand its simple handling has predestined it for use by even inexperienced users. A maximum roll diameter of 83 mm minimises interruptions caused by used up materials changing the roll takes only seconds. All of its mechanical parts have been optimised and a high-end auto cutter has been integrated to provide for a longer printer life cycle. Its reliability and performance clearly make this flexible device the choice for retail, hospitality and hotels. The integrated cutter has been designed to perform 1.8 million cuts, plus it automatically separates receipts cleanly from the roll with partial cuts or full cuts. If you choose, it can perform. Should a paper jam occur, the user can access the entire paper feeding conveyor directly under the casing lid. Together with its high MTBF and robust construction, this printer provides nearly error-free usage for many years. High performance of this brand name product is not only guaranteed via its robust hardware and intelligent features, but also via its accessory package. Except its interface which you can choose, the device is ready for immediate use - for example, power supply and receipt roll are included standard as part of an affordable package. But there is more Accessories such as splash proof cover, cable guard, buzzer and cleaning kit prolong the life cycle and broaden the spectrum of applications, at no additional cost. Connect the T-3 easily via the integrated USB interface. Decide for yourself how flexible your requirements are - additionally choose between parallel, serial, or Ethernetinterfaces, or the 802.11 b/g/n Wi-Fi version. No matter what you choose, this printer is easy to adapt to the given circumstances, saving you additional costs. Two integrated cash drawer connectors give you additional flexibility. Its construction engineers also intensively worked on its design. Its sleek appearance and small footprint make it especially suitable for seamless integration into narrow configuration concepts. Whether in POS, restaurants, at ticket counters or the reception, its high compatibility and large number of Windows and OPOS drivers guarantee quick and simple integration. Compatible with Windows 2000/XP/2003 server/EPOS/Vista/2008 server/7 32/64 Bit and OPOS Version 1.9, the T-3 is well equipped with special features and software tools. A Flash ROM 16 MBit ensures for quick and simple firmware updates, to help it adjust to future requirements. With its NV image tool, you export a corporate logo or special offer graphic directly from your PC to the printers 4 MB graphics memory. The Virtual Memory Switch Manager VMSM and Data-Statistic offer high flexibility and a continuous overview of hardware status.